Colin Thubron is one of England’s foremost travel writers. This skill is reflected in “Night of Fire”, his first novel in fifteen years. The plot is thin and irrelevant. It is structured as a biography of the fictional tenants of a Victorian house that is burning down. The characters are the landlord, a failed priest, a naturalist, a photographer, a boarding school boy and a traveler. For most of the novel it seems to be a collection of short stories. However, it seems more complex as it slowly progresses. A theme may be expressed in one line of one of the last stories. “We say that life is a burning house.” What “life” is may be existential. Science is juxtaposed against religious belief, and comparative religious beliefs yield alternative views of reality and existence. In the end, you are not sure if you have read multiple fictional biographies, or a composite of a single life. Parental abandonment is a common theme in many of the stories. It made me wonder, if the novel is partly autobiographical or merely consistent with the novel being about one life. The novel begins and ends with the landlord. He is an astronomy buff, and is peering at the celestial wonder of the universe. His other interests align with the other tenants. He is watching a rain of fire in the sky-sixty Quadrantids from a nova that left a dark void. The Protestant seminarians in the chapter about the Priest, are mostly broken children who are searching for their parent or parental approval through the church. Their theology is confronted by Orthodox Christianity at the monasteries near Mount Athos and by the Rwandan refugees in Tanzania who blend the teachings of the Church with their own orthodoxy. Some find the monasteries to be “a mirror of the celestial world, following a changeless scheme.” The Protestants separate from the dead. For the Orthodox Christians the soul is embodied within the body and the dead are connected to the living. Is belief and memory just a state of mind? Is the world created and destroyed in the brain? The chapter about the neurosurgeon is consumed by these questions. He is to operate on a man who believes he communicates with God through his seizures and is concerned that the neurosurgeon will “cut God out of me with your knife.” The surgeon explains the anatomy of God. The tenant Stephanie is a lepidopterist. The younger, ignored daughter of a deceased mother and a father who was cold to her. She finds wonder and beauty in the creation of butterflies. She finds love with an older woman. She is the exception to the postulate that the novel is about one life. The photographer lives in a world of illusions. Like Stephanie his reality is altered from his practical and successful older sibling. His relationships with women reflect his image of them, not what actually appears. Before he is consumed by the fire his drug induced dream has his memories being extracted by forceps, one by one, from his surgically opened head, until his empty shell of a body is suspended and rotates to gaze at him. The schoolboy chapter continued the theme of children that are mentally or physically separated from their parents. Here the child was placed in an English boarding school while his parents lived and worked in Cyprus. He tried to convince the Head of the school and his classmates that they died. He was reprimanded by the school and his more responsible older brother. He dreamed of a different existence. The Traveller ties the other biographies together into a novel and not a group of short stories. An old monk in Tibet conveys a different understanding of life, memory and God. Reading this novel takes patience. It is rewarded in the end. 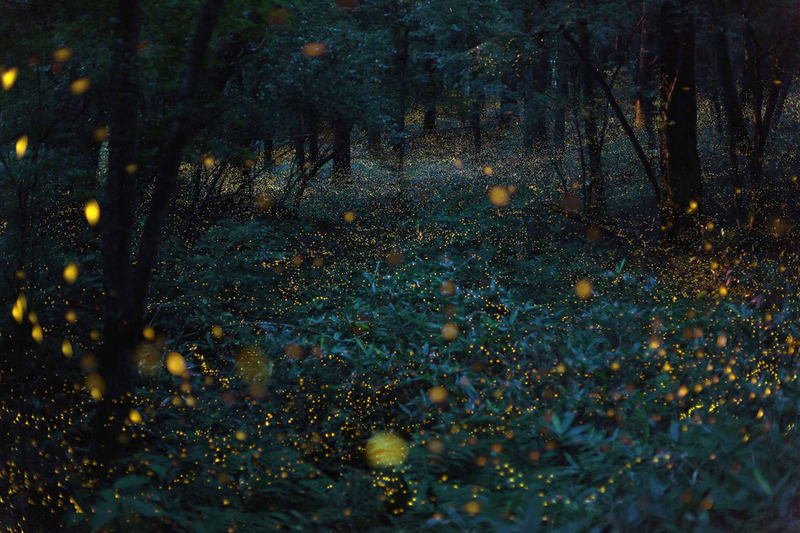 Photo of hime botaru by Takehito Miyatake. “A few weeks after we were married, I came home late one night. The house was dark. I ran inside, convinced something terrible had happened.” …. Philip Hutton is a half-breed of two influential families in Malaysia. His father, Noel, is the scion of one of England’s powerful trading families. His mother, Noel’s second wife, dishonored her influential Chinese family by marrying outside of her race. Like Philip she is an outcast. He is taken under the wing of his father’s Japanese diplomat tenant, Hayato Endo (Endo-san), who becomes his sensei in aikijutsu. This is a World War II novel about family, honor and prejudice born of race and history. The Japanese occupation of Malaysia is principally told from the British, Chinese and Japanese perspectives. There is only passing reference to fleeting support by the Malays for Japanese ouster of the colonial British. This limitation does not detract from the novel, which is a proverbial page-turner. The Gift of Rain was Malaysian native Tan Twan Eng’s debut novel. It garnered a nomination for the Man Booker Prize. The author sprinkles cultural references throughout this epic novel. Having a first-dan ranking in aikido, the author educates the reader about this style of martial arts. “The Garden of Evening Mists”, Tan’s second novel, was short-listed for the Man Booker Prize. It too is set in Malaysia during the Japanese occupation. There is a ying-yan to “collaborate”. In a positive sense it is encourages working together to produce or to create something. In a negative sense, it is cooperate traitorously with the enemy. Tan avoids the latter simple view. It is shaded by the life of half-breeds and by conflicting goals. In this sense, collaborate means to compromise. This does not diminish, nor excuse, the brutality of the product. For Endo-san and Philip, family and honor constrain choices, with fatalism and free will being the operative cultural debate between them. Each are emotionally scarred as the middle ground is the hard choice between extremes. Both of Tan’s books are published by the indie press Weinstein Books ( http://www.weinsteinbooks.com) . It is a partnership between The Weinstein Company and The Perseus Books Group (http://www.perseusbooksgroup.com), which publishes The Economist and other non-fiction imprints. The Weinstein Company is a multimedia and distribution company that was launched by the Weinstein brothers who founded Miramax Films. There is commercial value to this book, as it could readily be turned into a film or cable series, as Herman Wouk did with “Winds of War” and “War and Remembrance” with TV. James Clavell’s Asian series books have the same feel, although based in part on Jardines in an earlier historical period of Hong Kong and Japan. You will enjoy reading this book. I never read Doris Lessing. A friend, who is a dramatist, told me she was among her favorite writers. Ms. Lessing is well-known. A Noble Prize winner for Literature, “The Good Terrorist” was short listed for the Booker Prize. None of this mattered to Ms. Lessing. She thought such prizes were a curse to writers. Strong characters, particularly women, are the hallmark of her writing. She did characterize herself as a feminist. Her strength is the ability to write a well told story. The characters are strong and memorable. She was faulted for not being a stylist; a greater prose writer. This is fair, if that is all that matters. There are writers who strength is prose; others who are story tellers; and a few who are both. This book is the proverbial page-turner. I don’t know if it is part autobiographical, or if it is drawn from the Communist period of her life, before she later disavowed it. Daughter and mother in “The Good Terrorist” reflect both. Ms. Lessing’s description of personalities inherent in protest or other organization groups is universal and timeless. The principle character, Alice Mellings, is the product of a middle class background as are many in her faux radical group. She is closer to the working class than the others, many of whom actors from the upper class. The male leaders of this group are summertime revolutionaries: one day Communists, the next day IRA. They are bottom tier; never accepted by those who are true “revolutionaries”. The women in this group are subordinate, though superior; good to sleep with, but they cannot be titular leaders. Alice is the doer of the group. She is recognized by those who are the true “revolutionaries” as one they want to recruit. Alice however, is middle class at heart. Her relationship with her parents disintegrates because though in her 30s she is still voluntarily and because of stealing from them, still supported by them. The whole group is. Alice’s mother, Dorothy, like Ms. Lessing, was married at 19. Dorothy like Alice went through her anti-government period, only to realize later in life that everything was rubbish. Alice does not see herself in Dorothy. She also cannot separate herself from Jasper, her homosexual parasitic boyfriend, with whom she is in love. Ms. Lessing describes women with all their strengths and weaknesses. Dorothy knows that most protest groups are merely social. There are a few in each group who are committed and do most of the work, while the others show up for the thrills; cheap dates. In the end, Alice’s group demonstrates that it can cause damage, but it seems as if their mission, like spoiled children, was only to be recognized. Ms. Lessing was versatile. A writer of novels, short stories, plays, non-fiction, poetry and her autobiography.”The Golden Notebook” is one of her more well-known novels, but it is “The Fifth Child” that I may read the next time I read her. She had an invalid child and “The Fifth Child” concerns the birth of a demonic child and its impact on an upper middle class family. If you like a good story, well told, pick up “The Good Terrorist”. In my April 17, 2013 review of Jim Crace’s novel Harvest, I began my review by writing that it was a work in need of a prize. The long list for the Man Booker prize was just announced, and apparently the judges thought so as well. This is supposed to be Mr. Crace’s last book. It would be fitting if this book would earn him his first Booker prize. I again recommend that you read it.